Pakistan in all probability has breached US terms and conditions on how it can use the America-made F-16 combat aircraft by deploying them in an operation that targeted Indian military installations near the Line of Control (LoC) in Jammu and Kashmir. At a joint news conference by the three defence services on Thursday, the Indian Air Force (IAF) displayed parts of an American-made beyond visual range missile, called the AIM-120 Advanced Medium-Range Air-to-Air Missile, or AMRAAM, as evidence to "conclusively" prove that Pakistan used F-16 fighter jets during an operation targeting Indian military installations in Kashmir. "There is enough evidence to show that F-16s were used in this mission and Pakistan is trying to hide this fact. 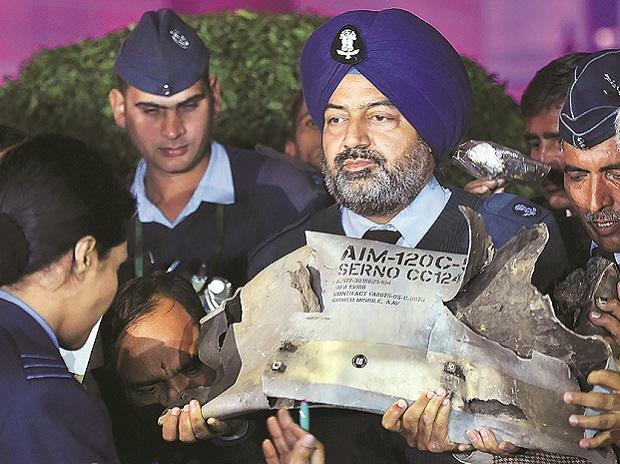 Also, parts of AMRAAM air-to-air missile which is carried only on the F-16s in Pakistan Air Force were recovered East of Rajouri within the Indian territory," said Air Vice Marshal R G K Kapoor, assistant chief of Air Staff. The missile in question can only be used by one aircraft in Pakistan's arsenal, the F-16. The IAF also identified the F-16s through their electronic signature. On Wednesday, Pakistan had categorically denied using F-16 fighter jets against India and said that none of its aircraft had been shot down by the IAF. Rahul Bedi, a New Delhi-based analyst with Janes Information Services, told Bloomberg that the US sale of F-16 aircraft to Pakistan decrees that they are to be used only for counter-terrorism operations and that they can't be deployed against any other country. Concerns that Pakistan would use these aircraft against India have been raised in the US in the past, and have held up the sale of such platforms to Islamabad. In April 2016, US lawmakers had reportedly expressed concerns over the then Obama Administration's decision to sell eight F-16 aircraft to Pakistan. Their concern was that the aircraft could be used against India instead of being deployed to combat terrorism. They had also urged the administration to review its decision regarding the sale. According to news agencies, US Congressman Matt Salmon had said during a Congressional hearing on the matter that many members of Congress, including him, seriously questioned "the judgement and timing of such a sale". He had said that "Indo-Pak tensions remain elevated and some question whether the F-16s could ultimately be used against India or other regional powers, rather than the terrorists as Pakistan has asserted". "We need to offer to Pakistan those weapon systems well- crafted to go after terrorists and not crafted for a war with India," US Congressman Brad Sherman had reportedly said. These statements were made during the Congressional hearing on Afghanistan and Pakistan convened by the Subcommittee on Asia and Pacific of the House Foreign Affairs Committee. Back then, the US Senate had put on hold the then US administration's decision to sell eight F-16 combat aircraft to Pakistan at an estimated cost of $700 million. Further, the US had asked Pakistan to use its "national funds" to buy the concerned aircraft as some US Senators had put a hold on using American tax payers' money to partially finance them. The sale was opposed by the Indian government, which had summoned the then US Ambassador to India Richard Verma to lodge its protest. Finally, in June 2016, Reuters reported that Pakistan was considering to buy used F-16 aircraft from Jordan after the plan to buy eight such aircraft from the US failed due to the US Congress' refusal to finance the deal. Air Vice Marshal Kapoor on Thursday also confirmed that "one F-16 of PAF (Pakistan Air Force) was shot down by an IAF MiG-21 Bison aircraft". Kapoor also said that Pakistani bombs had fallen inside Indian Army formation compounds, but "they were unable to cause any damage" to the military installations. After the IAF struck a Jaish-e-Mohammed training camp in Balakot, in the Pakistani province of Khyber Pakhtunkhwa, in a pre-dawn air strike on Tuesday, Pakistan on Wednesday sent its air force to target military installations on the Indian side of the LoC. According to the Ministry of External Affairs statement post the Pakistani action, Islamabad's "attempts were foiled successfully" due to Indian forces' "high state of readiness and alertness". "The Pakistan Air Force was detected and the Indian Air Force responded instantly. In that aerial engagement, one Pakistan Air Force fighter aircraft was shot down by a MiG 21 Bison of the Indian Air Force. The Pakistani aircraft was seen by ground forces falling from the sky on the Pakistan side. In this engagement, we have unfortunately lost one MiG 21. The pilot is missing in action. Pakistan has claimed that he is in their custody. We are ascertaining the facts," the statement had said. Subsequently, it was officially confirmed that the pilot, identified as Wing Commander Abhinandan Varthaman, was in Pakistani custody. Wing Commander Abhinandan is to be repatriated to India on Friday.